Maine schoolgirl Samantha Smith sent a momentous letter to Yuri Andropov, then General Secretary of the USSR, in autumn of 1982. She asked the Soviet leader, “Are you going to vote to have a war or not?” and “why [do] you want to conquer the world or at least our country?” Andropov’s response, sent in April 1983 via the Soviet Embassy, invited Smith to come to the Soviet Union that summer and be part of a cultural exchange program, spending time in the Crimea at a Pioneer camp. Smith became a media sensation worldwide, but especially in the U.S., where her appearances on The Tonight Show and Nightline showcased her peace activism. 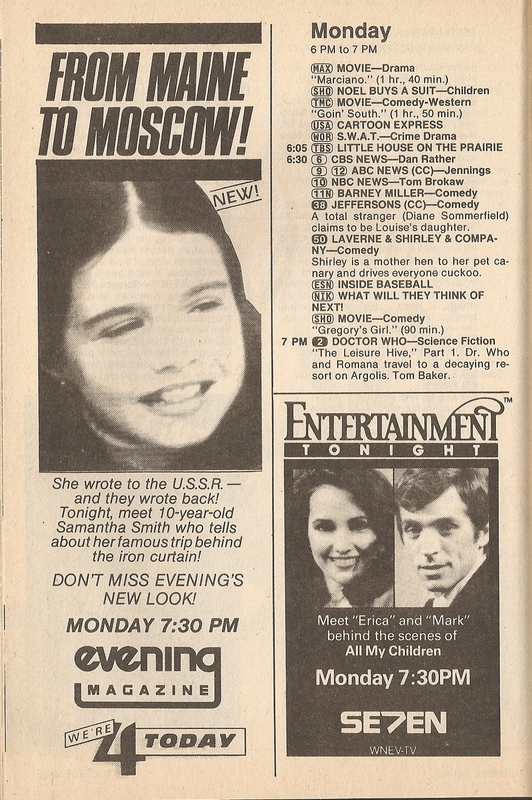 In the time after her trip to Russia, she worked with the Disney Channel covering the 1984 election, made a cameo appearance on sitcom Charles in Charge, and earned a starring role in the Robert Wagner series Lime Street. Smith’s life was tragically cut short on August 25, 1985, when her small commuter plane crashed near Lewiston-Auburn Regional Airport in Auburn, Maine, killing all six passengers and two crew members. Tributes followed from both U.S. and Soviet leaders, and her memory was enshrined, especially in the Soviet Union (where many believed that “President Reagan” was behind the crash), with civic tributes. Evening Magazine, a nightly newsmagazine television format pioneered by Group W’s San Francisco affiliate KPIX and subsequently adopted by many Group W affiliates around the U.S., featured human interest and entertainment stories with local hosts introducing the content, aping popular network shows like Real People and That’s Incredible. In Boston, then-NBC affiliate WBZ-TV featured a version of the show with future America’s Funniest Home Videos host Tom Bergeron. Hi: Growing up in the Boston area, I remember Samantha Smith and the coverage of the letter quite well. Her death and the plane crash were very sad. I believe her mother and the surviving family set up a museum and a youth exchange program based in Maine but last I read it was struggling for funds/donations and may have closed. Actually Evening Magazine’s original hosts in Boston at WBZ-TV channel 4 were Sara Edwards and Barry Nolan–or they were the longest running hosts with tenure during the 1980’s. During the 80’s, Tom Bergeron was a correspondent on Evening Magazine and a host on a few other shows on WBZ TV Channel 4 Boston, but in Boston before his national fame, Bergeron probably best known for hosting a day time talk show called: “People are Talking.” He wasn’t the only host but I think he had the longest tenure there. Please note, I interned at WBZ News Summer 1991. By then Evening Magazine was cancelled (we used up a lot of their old stationary), and People Are Talking I think had recently wrapped but I remember there were signs for the audience members all over the station. The coffee & donuts sign was taken off as a joke and put over the special projects/news producers desk/counter. Evening/PM Magazine format/show was replaced at that time by “The 7:30 Report” which featured local news and long form stories anchored by Randy Price–a sort of challenge to WCVB Channel 5’s venerable “Chronicle.” As for the Evening Magazine alums, Sara Edwards went onto being a TV/film critic, left the Boston market, returned and left again. Barry Nolan worked for the tabloid news show “Hard Copy” then for the Comcast News Channel (before they bought NBC), and when it was based/out of Philadelphia but he was fired for making a political donation/conflict of interest. Needless to say, as you can tell from this Exhibit, I’m kind of a nut for Boston TV history; watch in the next couple of months for my further deep-dives into Boston-area TV Guides!